On March 30, 2018, over 30,000 Palestinians marched towards the fence that surrounds the Gaza Strip with the intention of returning to lands that they were exiled from 70 years ago. Israel opened fire on the protesters. In the subsequent months, over 150 Palestinians have been killed and at least 15,000 more wounded. This massacre is part of a larger pattern of ongoing Israeli violence and oppression of Palestinians dating back to the foundation of Israel — oppression which the McGill administration is complicit in. In response to efforts by the student body to pass legislation supporting the Boycott, Divest, Sanctions (BDS) movement in 2016, Principal Suzanne Fortier condemned the motion and explicitly intervened in student politics, stating, “the BDS movement, which among other things, calls for universities to cut ties with Israeli universities, flies in the face of the tolerance and respect we cherish as values fundamental to a university.” Statements like these reveal our university’s unrestrained political motives, and confirm that administrators are willing to isolate and repress students and community members with dissenting political opinions. Last summer, McGill awarded an honorary doctorate to Hillel Neuer, a Zionist activist and executive director of the NGO UN Watch, a so-called “watchdog” group which has made its mission to call out the UN for “singling out” Israel. In fall 2017, the Students’ Society of McGill University (SSMU) Board of Directors declared BDS and other similar motions unconstitutional, effectively squashing students’ rights to free speech, protest, political participation, and dissent. When students voiced their concerns about this issue and took steps to hold the board members accountable for this act, they were smeared as anti-Semites. Analogous to the conflation of anti-Zionism with anti-Semitism, the framing of Palestinians as “Hamas terrorists” is a well- known scare tactic, designed to deflect observations of Israeli brutality. Similarly, Neuer’s work at UN Watch has revolved around excusing Israeli violence by pointing out crimes and abuses carried out by other countries, as though such actions mean that Israel should hold no blame for its crimes. He has been banned from speaking at the UN Human Rights Council for his hateful speech, has accused Amnesty International of being “pro-Taliban/Hamas,” and likened respected Canadian intellectual Naomi Klein to a Nazi. Hillel Neuer also has a long history of spreading Islamophobia and skewed information, and has previously called parts of the Middle East a “ticking suicide bomb.” As McGill University claims to oppose these sentiments, awarding an honorary degree to Neuer is deeply inappropriate and insulting to students who are affected by these issues. Neuer has been banned from speaking at the UN Human Rights Council for his hateful speech, has accused Amnesty International of being “pro-Taliban/Hamas,” and likened respected Canadian intellectual Naomi Klein to a Nazi. On November 30, McGill received an Access to Documents request regarding the decision to award an honorary doctorate to Hillel Neuer. On January 23, the McGill administration refused to release any information and claimed that all documents are confidential. This lack of transparency from the administration is concerning, especially given Hillel Neuer’s hateful rhetoric. 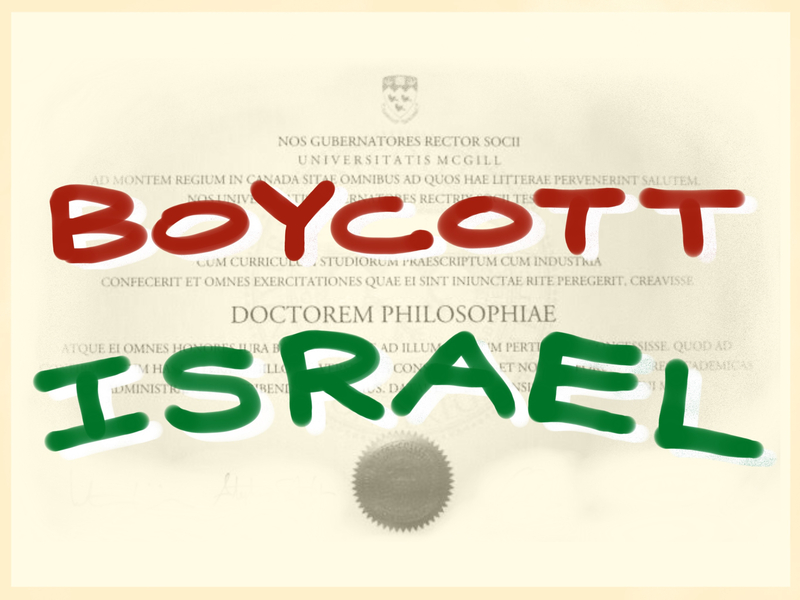 As McGill students, we must condemn McGill’s decision to award an honorary doctorate to Hillel Neuer, given the circumstances in Palestine and on campus, and call upon the administration to rethink this decision.